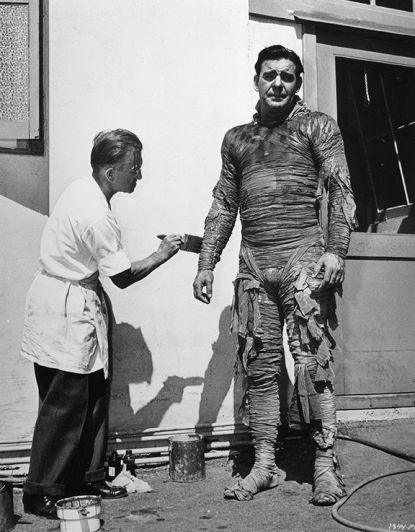 From the private collection of Conrad Brooks - High Resolution photograph of Jack Pierce applying the finishing touches to Lon Chaney JR as Karis, the mummy. From the private collection of Conrad Brooks - High Resolution photograph of Jack Pierce applying the finishing touches to Lon Chaney JR as Karis, the mummy. One of a series of publicity shots featuring Pierce and his "children", the classic Universal Monsters from the mid 1940s. Chaney was well known for having little love for long hours in Pierce's makeup chair as is clear in this instance from the look on Chaney's face.